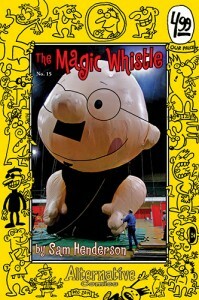 The 15th issue of Sam Henderson’s long-running and award-nominated MAGIC WHISTLE is here with way too many gags, Dirty Danny’s private island, more fun with Monroe Simmons and the world’s meanest gym teacher, the return of ‘Always Funny’; plus guest appearances by Steven Kraan, back cover art by Victor Cayro and a three-page confessional about her tryst with the Thing by Meghan Turbitt. 32 pages. Black and white comics. Color covers.